Terracotta is a hard surface tile flooring material. It is actually a type of ceramic, made from distinct red or earth-hued clay. This clay is shaped into the desired tile and then allowed to dry, before being fired to temperatures in excess of 1000 degrees Fahrenheit. The result is a hard, durable flooring cover that is naturally porous and susceptible to stains. Some terracotta tiles are mass produced by machines which use relatively precise computer guided sawing mechanisms to create large quantities of the material quickly, efficiently, and with precise common dimensions. These pieces still have the distinct colors of terracotta clay, but they are made to fit perfectly together in patterns or rows. Another option is to purchase handmade terracotta tiles. These are crafted by artisans and are generally less precise and exact than their machine cut counterparts. This is sometimes prized in that it can give the floor a feeling of distinct personality. These tend to be more expensive, and more difficult to properly install. $1.00 - $6.00 per sq. foot. Can go as high as $15 per piece for specialty medallions. Terracotta refers to a variety of fired clay materials that can take on numerous sizes, shapes, patterns, and designs. While you can roughly choose the color range of the material, it’s natural pigmentation will vary, making each piece a unique, one of a kind work of natural art. These pieces can then be fit together in a nearly infinite variety of patterns. Important Note: The quality of a piece of terracotta is going to vary wildly based on how it was manufactured. It can also be particularly difficult to discern good materials from bad, even when looking at them or touching them. But low-quality tiles will have a much shorter lifespan and will be much easier to damage. That makes it vital that you purchase from a reputable manufacturer with good reviews and a quality guarantee. Whenever making atole flooring purchase it is important to get the dimensions of the room and then add ten percent to them at least. This will account for waste, and any cuts that you end up having to make. You also want to try and hold on to a few extra tiles at the end. These can be used as replacements for repairing broken or stained pieces. Because this material is so porous you will have to apply a sealing agent to it every one to two years in order to protect it against stains and damage. Even with the regular application of this chemical sealant, you should still probably avoid installing this in spaces that are prone to high levels of traffic or water hazards. Otherwise, maintenance just requires you to sweep the floor clean of debris regularly. 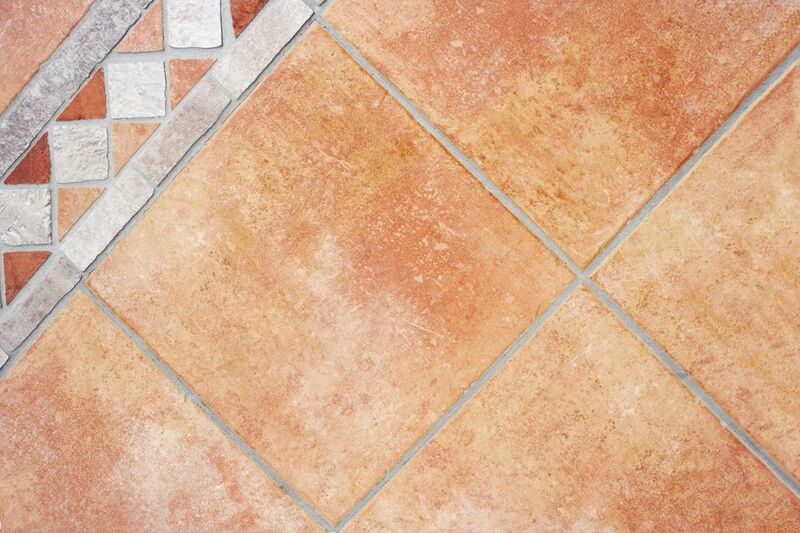 In general, you also want to avoid ever allowing standing water to rest on a terracotta floor. All spills and drips should be wiped up immediately. If a stain does occur a warm compress can be used to attempt to extract the agent from the material. The look of a particular type of terracotta tile is based on where the clay used in its manufacture was quarried. The most common locations where these materials are produced are Mexico and a few places across Europe. Each quarry clay will be slightly different, and there can even be variations across strands in a single quarry. In general, the colors are going to consist of reddish amber hues, or possible darker earth tone colors, that merge and mash in a melody of multi colors which are unique to each piece. This can evoke a very rustic feel, while at the same time having a warmth and welcoming grace that can gentle the feel of a space.